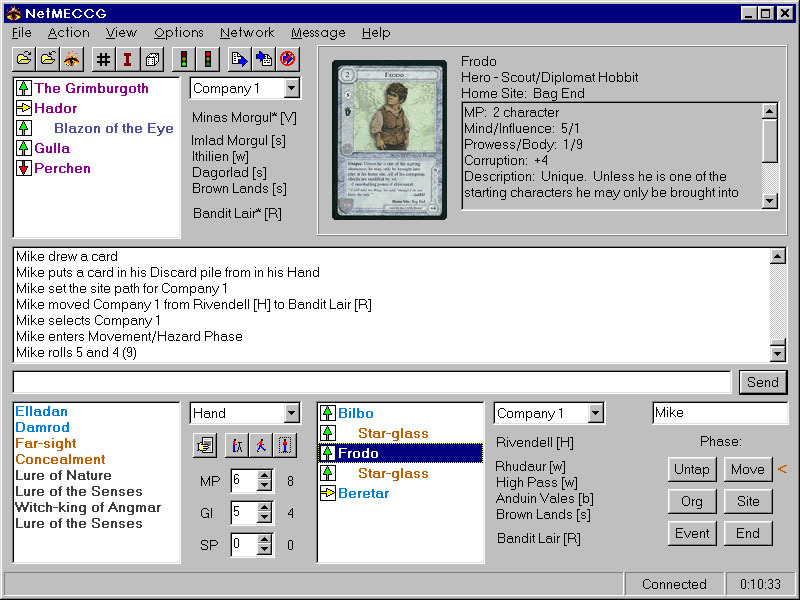 NetMECCG is a Windows program that allows two players to play the Middle Earth:Collectable Card Game across the Internet. NetMECCG knows nothing about the rules of MECCG, it simply acts as a "virtual table"; it allows you to play, tap, move, etc. cards in whatever way that you want. It allows you to save/load games, to log the game to a file for later review, to make custom decks, etc.---(hopefully) everything that you will need to play MECCG. Best of all, it's FREE! 07/12/05 : The NetMeCCG home page is back on-line, now hosted at meccg.net. A number of old links have been cleaned up on this occassion and third party e-mail addresses have been removed to avoid them getting spammed. Note that my ohio-state.edu e-mail and 3843 Cassidy Drive snail-mail addresses - as found on these pages and in the distribution files - are hopelessly outdated. 09/25/99 : Released NetMECCG v1.4.1. This has been done for awhile, but I finally got around to posting it. It has some bug fixes and some new features---most notably, that the executable is not corrupt (I found out that I had bad RAM in my computer when I compiled v1.4). See the revision history for a complete list of changes. Some example card sounds to liven up your game. (unzip in the CardSnd subdirectory --- make sure you use an unzip program which is long-filename aware). (93KB) You'll find many more sounds at Chad Martin's web page. 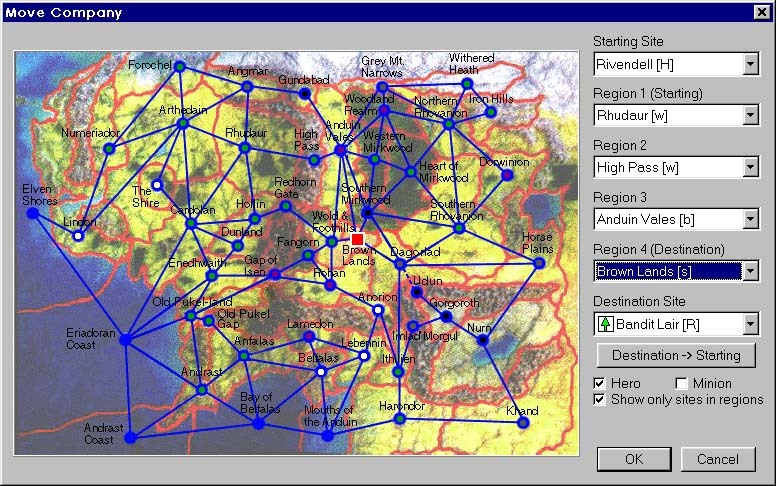 I've heard of two other tools: Middle-Earth Mover by Andy Fredricksen, which helps you to move around Middle-earth, and NetMECCG Database Editor (NMDBE) by Paul Choquette, which gives the curious a peek into NetMeCCGs database. Especially the latter might still be on the net somewhere. The Middle Earth:Collectable Card Game is by Iron Crown Enterprises, Inc., Charlottesville, Virginia, USA, which reserves all rights in its intellectual properties. NetMECCG is a non-profit program for non-commercial use only, and should not be redistributed for profit. Any questions pertaining to the use of the copyrighted material should be directed in writing to ICE, P.O. Box 1605, Charlottesville, Virginia, USA, 22902-1605. The Hobbit, The Lord of the Rings, and The Return of the King, and all character and places therein, are trademark properties of Tolkien Enterprises. All characters and places derived from the works of J.R.R. Tolkien are common law trademarks used under license from Grafton Books (Harper Collins), publishing successors to Unwin Hyman, Ltd. and George Allen & Unwin, Ltd., London, UK.